Admonitions such as this to my daughter were commonplace during the years my kids and I spent raising each other. I say that because I’m pretty sure they did as much to help me mature then, as I hopefully did for them. Part of this reciprocal learning process was for me to realize that every child’s personality, even siblings born to the same parents, is completely different—different likes and dislikes, different motivational factors, different outlooks on life. All of this, of course, means two different methods of child rearing. In those days, Robin and I communicated frequently and at length. So much so that at times we lapsed into leaving written communiqués for each other, which gives rise to this weekly missive. I have saved everything, some would say almost literally, to the point that I now need to thin out a life-long collection of memorable artifacts. It was either that or move out, and although it was a tough decision, living indoors is something I’ve become really fond of doing. The archival dig has unearthed hundreds of inner-house notes and messages. To the point of differences in siblings, this was not the case with my son, Lee. He didn’t talk until almost two years of age. Then for a while afterward, we thought he would never quit. These days, conversations with him can go either way. 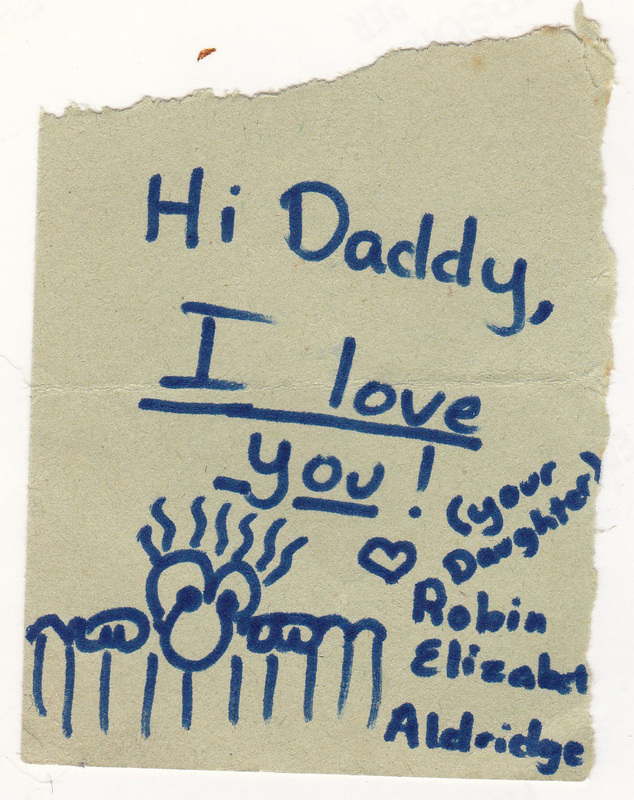 Going through the boxes of keepsakes from rearing my children, I was reminded of the most rewarding conversations with Robin—the “make a note and let’s get back together” sessions. Robin and I would meet on the back porch for rocking chair discussions, better known as debates. These were more often than not, to allow her a chance to sell me on something which she was reasonably convinced from the outset was going elicit a quick “no” from me. So, a rocking chair conference was called. She would present her case. And, she was good at what she did. It was no small coincidence that Robin was on the Bandera High School debate team, and also no fluke that they always placed well in UIL competition. She got lots of practice working on ol’ dad at home. They usually went something like me rocking, looking out across the back yard down toward the Medina River and listening quietly, nodding or wrinkling my brow every so often, trying hard not to tip my hand on which way I might have been prejudiced. My “kids” are 35 and 37 this year, and in case you haven’t picked up on it, I love them both very much. Funny, it never occurred to me until just now. I wonder if she’s using the “make a note and let’s get back together” tactic with her children? We too have a plethora of memorabilia from our children. I wish we had had the forethought of using the phrase ” get back with me in ten years.” I will pass this article on to our children. It just might come in handy in ten years!! Great article! Thanks Susan! I appreciate the vote of confidence you’re granting by passing this on to your children. I’m humbled. If I could remember where the idea originated, I’d share that as well. Just something I did. As with all parents, always glad to know that some things we did worked! But it’s not as bad as I’d feared. I’ll sit more when I don’t have 2 to 13 year olds. I can dream, right? Also, last week Haven signed a note that she made for me “Your Daughter, Haven”. I thought it was a bit odd. Of course she’s my daughter. It’s not like I would forget. But then I saw this and remembered the feelings that went with it! There is a stability and security in knowing that you are securely tied to someone who is trustworthy. Those teenage years are scary. The search for identity and belonging are all-consuming. Thanks for the reminder and encouragement this morning! I think I’m going to go hug my Daughter(s).